The Jaguar GR.1/GR.3 is Kitty Hawk's second release of the Sepecat Jaguar in 1/48th scale. There are many things in common with the first release. The molding is very well done, and the plane has a great shape. One thing off the bat you will need to watch for is the instructions. 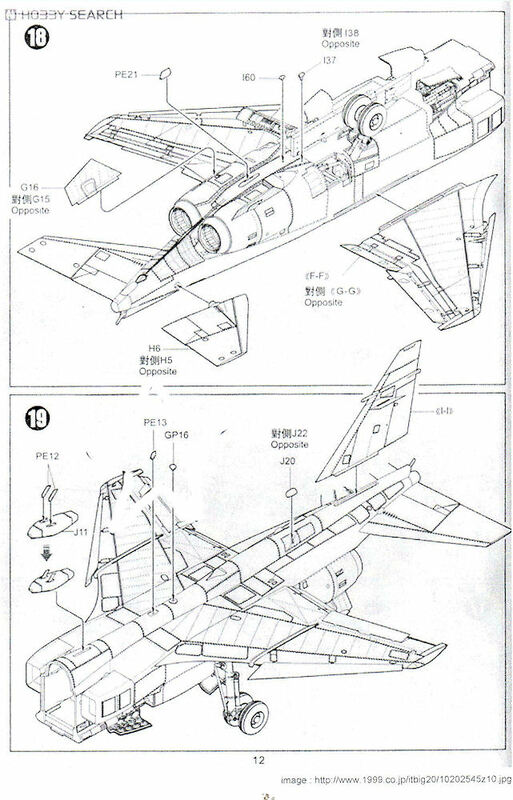 In my booklet of instructions (which have great color views of the entire plane and all schemes and the weapons), steps 19 and 20 were missing. These steps involve adding the wings and tail parts, as well as the location of several parts on the bottom and top. A quick e-mail to Kitty Hawk and they forwarded the missing steps - I have scanned them and attached them here. The second problem with the instructions is that several of the parts were very difficult to place and the directions were a little vague. A few brief internet searches, and these were resolved. Construction started with the cockpit, which is very nice and has several PE additions to enhance it further. One thing I missed in the instructions is the seat belt. It is photoetched and not shown being added, but magically appears on the seat in later steps. The main gear well was built and added. There are several smaller glass parts that can be added, but I left them off and used Microscale Cristal Clear to get the window effect. The rest of the nose parts fit well with minimal or no sanding. Wheel well construction started next and was simple after noting that the gear bays, struts, and parts are very specific for left and right sides. Also, the struts attached to the outside of parts I20/I21 and mated to the large landing gears bays. The fuselage was pretty flimsy until I added the parts, then firmed up nicely afterward. There are also opened-up gun bays on both sides. The intakes were added, and then the engines were built. Both are very nice and have PE inside the exhaust, which gives it a great look. The sad thing is that these engines and bays are closed and never to be seen again. At this point, I started having some difficulties. The three-part engine covers fit okay but needed putty. I decided to close the wheel wells and gun bays - things didn't fit tight and it took a lot of work to get an acceptable fit. Leaving them open eliminates all of these fit issues. The wings were built and had great detail, with dropped slats and flaps. Fit was good and it added a lot to the appearance. At this point, the forward fuselage, rear fuselage, and tail parts were added and, again, the fit was very good. A few primer and sanding rounds and I was ready for paint. I chose the GR. Mk.3 from the 54th Squadron with its white and Medium Sea Gray scheme. The canopy was masked and I tried something I have always wanted to test. I highlighted all of the panels lines with black, and then started misting on a light gray. The centers of the panels were highlighted almost white and then the gray added, and highlights were again added with lightened gray. It provides a nice mottled effect. You can see it in some of the shots. I added the decals and they worked well. A clear coat followed, and then a water color wash of dark gray was added to the panel lines. For the weapons, I added the fuel tank on the center line and then two BGL-480 bombs. I wanted to add the BGL-1000 but, while it says you can build two, I only found parts for one. I also used the Matra 155. The kit has the over-wing pylons with options for AIM-9M or Magic 2 missiles. I left these off. All of the weapons, pylons, and doors were added and the kit flat-coated. Then unmasking was done. Various glass parts were added and the kit was finished. All-in-all, a nice kit. I would recommend having a few kits under you, just due to some parts being mislocated and the complicated fuselage, plus PE. It looks like the Jaguar and except for the fit issues, this is an excellent kit and the best Jaguar out there. My thanks to Kitty Hawk Models and IPMS USA for the chance to review the kit.